….and so it snows!!!! 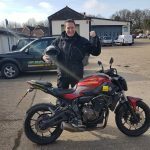 Bad luck for JC (Jeremy Corner) having completed his CBT with us in January, waited for better weather to complete his DAS, after all the training it snows on test day and all the tests were cancelled! Poor Jeremy, determined to ride that KTM across the Gobi dessert, didn’t give up though. He came back more determined than ever to achieve his goasl, and he’s now done it!!!!!!!!!!!!!!!!!!!!!!! Well he has his full DAS licence anyway…so now for the desssert, a far cry from the rain, wind and snow you’re used to JC!